Codependents live in a pain-filled world of shame and fear. They often suffer emotional stress that may result in health problems. To cope with this pain, they sometimes make poor decisions that lead to personal addictions of their own or other harmful behaviors like extramarital affairs. They may even lose faith in God. The one they are trying to help cannot give them support, so they lose trust and shut down their feelings. Because they are hiding the problem, they cannot talk to anyone. 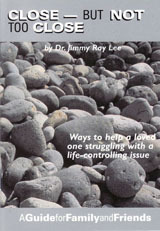 They are not helping their loved one; in fact, they are enabling him or her to continue the misbehavior. And they are hurting themselves. The simplest definition of codependency is "to be dependent along with." That does not mean we necessarily use the same substances or participate in the same kinds of behaviors. What it does imply is being so deeply drawn into another person's life that we are filled with guilt and blame and other downgrading thoughts. But that is not who we are . . .
We must remember that our significance is in Christ. Only in him can we find healing from the pain. Only through him can we be free and confident. Learning to live out the reality of who we are in Christ begins with making a choice: Whom will we honor? After making that choice, we will have to practice putting that reality to work in our lives. Father, I have been in so much pain. Guilt and frustration have overwhelmed me. I need you. I do know that my only hope is in you. Jesus is my rock and my salvation. I am special because of your love for me. Help me remember that as I keep my eyes on you, I cannot be shaken. In Jesus' name . . .